152 labyrinths found. Showing 1-20. Sorted by country, state, city, then zip/postal code. Three path personal labyrinth - mown in grass. Also have 2 portable labyrinths, a 3 m 3 path personal labyrinth and a 14 m 12 path Chartres replica labyrinth - both painted a red earth colour on unbleached canvas. 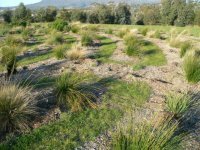 It's actually semi-permanent - if the grass grows too quickly, it can be obscured. Opposite the Servies car park, the entrance is about 2 metres north of the base of the lone cedar tree. 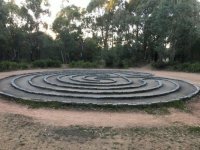 The labyrinth is made of white plastic discs hammered into the ground - in summer, the grass growth sometimes obscures the discs from view until you are almost on top of them, so keep searching! It is about 54 feet in diameter, so you should find it. White plastic discs (Line-o-dots) hammered into the ground. Located to the west of the Keeping Place in the flat garden area towards the New England Regional Art Museum. Clearly visible from the road. 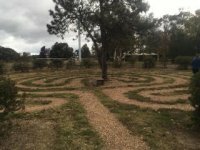 The dome house and labyrinths are at the back of the Ballan Train Station. The dome can be seen from the station platform. Ballan is a small town just before Ballarat on the Melbourne to Ballarat train line. Come by train. If driving from Melbourne take the Western Highway and the turnoff to Ballan, and find your way to the back of the train station. I intend for them to be open during daylight hours. The large one takes about half and hour to walk. The small one takes seven minutes. I am the owner of the five and two thirds acres. You can enter by any of the three gates. There are two labyrinths already, and another four in planning. The large one is known as a Left Entry Triple L Venus Labyrinth. The small one is a Right Entry Single L Labyrinth. The next ones to be marked out are a Left Entry Single L Labyrinth, and a Right Entry Double L Labyrinth. As things progress each will be given an Australian theme and 550 sugar maple trees will be planted as part of the paths delineations. 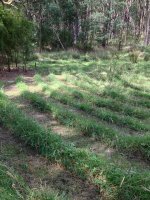 Other trees, plants, flowers, shrubs will also be planted so eventually the whole property is a garden built around the labyrinths. About one hour from Perth city by train or car. Close to Mandurah. From the 15 Blackall Street entrance, walk past the buildings on the right (St Mark's Theological Centre) and the Giant Cross, and Firepit, and then about 20m beyond is the labyrinth. Friday 10 April 2009 construction begins 9am, walking by lunchtime until Sunday April 12 after the dawn service at 6.30. 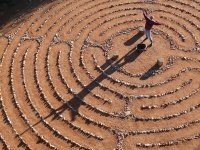 However, as the lines will be painted on the grass, the labyrinth will be available to walk over the rest of the Easter weekend. Not suitable for wheelchair use, but is accessible to view. 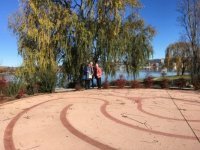 Named the "Heart of Contemplation," the labyrinth at Strathwilliam Homestead is a triple spiral inside a heart. The individual spirals represent the past, present and future. 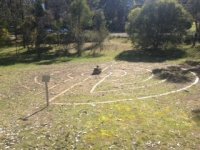 This labyrinth is called "Steping Back in Time" created for an annual sculpture trail art exhibition at this beautiful farm cafe in southern Tasmania.